Xeroderma pigmentosum (XP) is a member of a group of diseases called DNA repair disorders. These disorders cause problems with fixing damaged DNA. Damage to DNA happens constantly. It is caused by such things as ultraviolet light in sunlight and flourescent lights. Other things that can damage DNA include ionizing radiation from X-rays and other medical devices. Chemicals, normal processes in cells, and other substances or processes can also damage DNA. Because damage occurs all the time, living things have evolved many systems for fixing it. There are proteins that recognize that damage has occured, enzymes that remove the damaged DNA, and enzymes that insert new, undamaged DNA bases. This list is not exhaustive. When a person has a defect in one of these repair systems, disease results. If the problem is in a system that fixes damage from UV light, a person may be extremely photosensitive, with some people burning badly after only a brief exposure on a cloudy day. Overall, DNA most people with DNA repair disorders have a high risk of cancer. XP is a member of a DNA repair disorder subgroup in which repair of UV-induced damage is defective. In uncomplicated XP (the condition described on this page), patients are very sensitive to UV light and are at very high risk for skin cancers. In fact, XP patients overall are 10,000 times more likely to develop non-melanoma skin cancers than the general population, and 2,000 times more likely to develop melanomas (1). Many patients sunburn easily, although not all patients have this problem (2). In many patients, a sunburn following minimal sun exposure is the first sign of disease. Unfortunately, the sunburn may be mistaken for child abuse. Roughly a quarter of XP patients have neurological problems. The condition described on this page is not associated with neurological problems, and in non-neurological patients, and XP is not a progressive disorder (meaning, it does not get worse with time). However, it is important to note that the effects of UV exposure in XP patients are cumulative, and patients must be strictly protected from UV light (see below for more information). XP patients who have not been assiduously protected from light typically develop their first skin cancers before the age of ten (sometimes before the age of five). People with XP sometimes refer to themselves as XPers (said as X P -ers). See the section on Differential Diagnosis below for more information on the neurological forms of XP. XP patients do not have a common facial appearance, with the exception of XP-CS patients. XP is confirmed by testing for mutations in the genes XPA XPB/ERCC3, XPC, XPD/ERCC2, and XPE/DDB2, XPF/ERCC4, XPG/ERCC5, and XPV/POLH. The genes most commonly involved in non-neurological cases of XP are XPC and XPV. Patients with these mutations tend to not burn easily, making strict avoidance of the sun in this group more of a challenge. Some patients with mutations in the other genes listed above may also not have neurological problems, but may be more prone to burning. There are a number of other freely available sources of information on XP, including those cited in the columns at the right. If your child's doctor isn't familiar with XP, the information in reference 2 may help. There are also freely available publications with photographs of XP patients of different races and ethnicities (3,4), and a parent's account of account of the disease (5). The US National Institutes of Health maintains a list of laboratories that do testing (see link at right). Your doctor can obtain a sample from you or your child and send it to a testing center. The differential diagnosis for XP includes the other XP-related diseases, including XP-CS, XP-neurological disorder, and trichothiodystrophy/TTD, particularly TTD caused by mutations in XP genes. At the level of skin manifestations, all these conditions are effectively the same and require the same management: strict avoidance of sunlight and other sources of UV light. Although sensitivity to UV light differs among patients, all XP patients are nonetheless at increased risk of UV-associated malignancies and UV-associated disfigurement. Uncomplicated XP generally does not cause neurological problems, and XP may be distinguished from the three conditions above by the absence of these problems. It is important to know that neurological problems may not be evident in early childhood. They may even begin to show in adulthood, including middle age. If the results of genetic testing are available, clinicians should monitor patients with mutations in genes associated with neurological forms of XP and/or schedule consultations with neurologists. Rothmund-Thomson syndrome (RTS) is also similar to XP, in that patients are usually born with normal skin that shows pathological changes in infancy. By the age of 2, RTS patients have usually developed a rash-like skin condition called poikiloderma on their cheeks. Poikilodermic rashes are hypo- and hyperpigmented, meaning that they have areas of too little and too much pigment. The condition may resemble a sunburn. It spreads to the rest of the body, and skin atrophy may develop. Clusters of thin blood vessels called telangiectases are often seen under the skin, as is the case with XP patients. Like XP patients, RTS patients are also at increased risk for skin cancer, though skin cancers do not tend to develop in childhood, as they do in XP patients (especially those who have not had adequate protection from the sun). While intelligence is usually normal, a minority (less than 15%) may have intellectual disabilities. In addition, some RTS patients are sensitive to sunlight, and their rash may be worse on sun-exposed skin. Unlike XP patients, however, the rash on RTS patients can occur on non-sun exposed areas, such as the buttocks. This difference may help distinguish the two conditions in the absence of genetic testing. RTS is caused by mutations in the gene RECQL4. Another abnormality that can help distinguish RTS from XP-neuro is that many RTS patients have absent bones (including forearms or thumbs), malformed bones, and/or fused bones; see our RTS page for photographs. These problems are not generally associated with any of the XP disorders. Since 1999, the National Institutes of Health has been running a large study of people with TTD, Cockayne syndrome, and xeroderma pigmentosum. The study is called Examination of Clinical and Laboratory Abnormalities in Patients with Defective DNA Repair: Xeroderma Pigmentosum, Cockayne Syndrome, or Trichothiodystrophy. The goal of the study is to document health problems occuring in people with these diseases in order to understand them as completely as possible. More information about the study, including contact information, is available at clinicaltrials.gov. 1. Lehmann AR et al. (2011) Xeroderma pigmentosum. Orphanet J Rare Dis 6:70. doi: 10.1186/1750-1172-6-70. Full text on PubMed. 2. Sethi S (2013) Patients with xeroderma pigmentosum complementation groups C, E and V do not have abnormal sunburn reactions. Br J Dermatol 169(6):1279-1287. Abstract on PubMed. 3. DiGiovanna JJ et al. (2012) Shining a Light on Xeroderma Pigmentosum. Journal of Investigative Dermatology 132(3):785-796. Full text on PubMed. 4. Mareddy S et al. 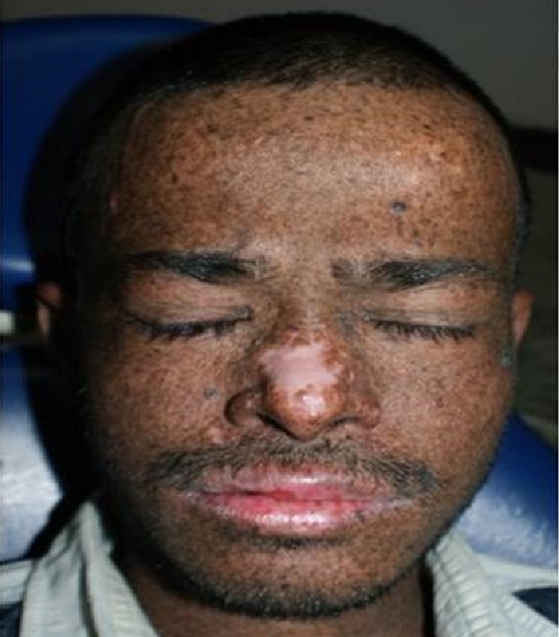 (2013) Xeroderma pigmentosum: man deprived of his right to light. Sci World J 2013:534752. doi: 10.1155/2013/534752. Full text on PubMed. 5. Webb S (2008) A patient's journey. Xeroderma pigmentosum. BMJ 336(7641):444-446. Full text on PubMed. 6. 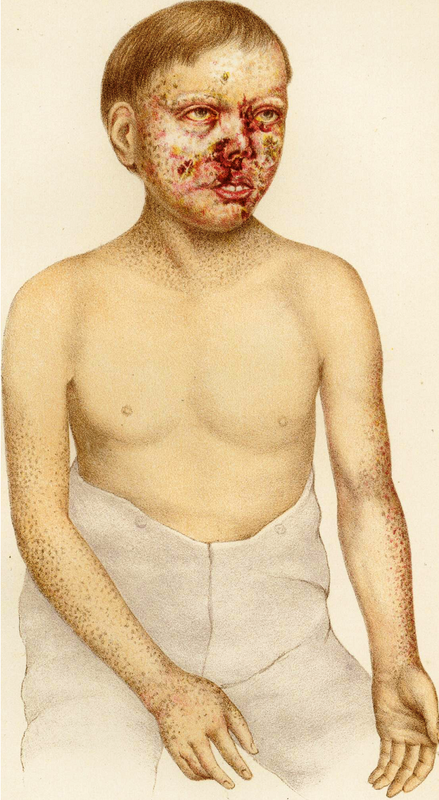 Radcliffe Crocker H (1884) Three cases of xeroderma pigmentosum (Kaposi) or atrophoderma pigmentosum. Med Chir Trans 67:169-188. Full text on PubMed. Above: An XP patient who lived during the 19th century. This boy was 9 years old when this lithograph was made. with XP. The skin on his nose also shows signs of atrophy. See reference 4.
mouth fully, affecting oral hygiene. See reference 4.